As the White House struggles to move past another self-imposed crisis, Democrats are fighting to ensure this one isn't quickly forgotten. Fiery Democratic leaders from Vermont to New Jersey to Texas met President Donald Trump's executive order to stop dividing immigrant families with deep skepticism, promising waves of protests, border visits and congressional oversight to shine new light on the Republican administration's immigration tactics. "I'm still on the highest level of alert. I still think we're in a state of national crisis," New Jersey Sen. Cory Booker told The Associated Press in an interview. Yet for all the outrage, the fallout from Trump's policy to separate children from their parents at the border — and his subsequent reversal on Wednesday — highlighted a scattershot strategy from a Democratic Party still searching for new leadership and a consistent message as the Trump presidency stretches deeper into its second year. The kitchen-sink approach comes as Democrats work to sustain the energy of the Trump resistance heading into this fall's midterm elections when the GOP's House and Senate majorities are at stake. 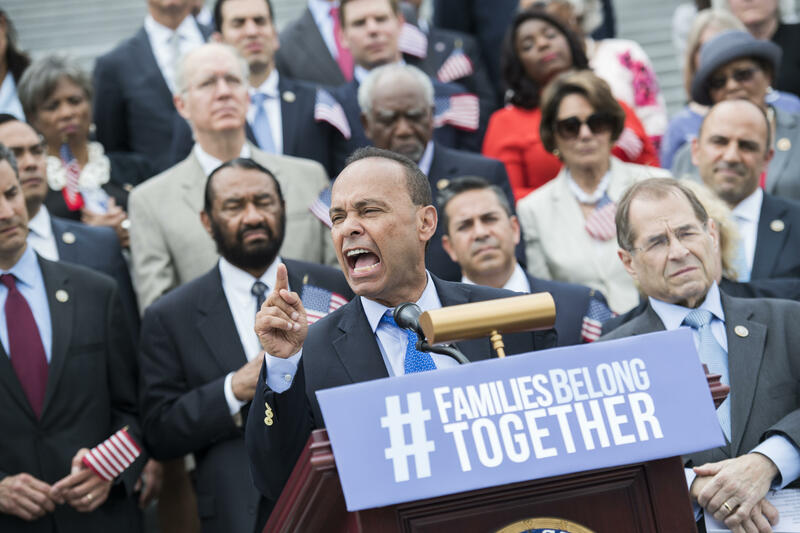 At the same time, the Democratic Party's most ambitious were eager to play a leading role in the high-profile immigration debate as a possible precursor to the crowded 2020 Democratic presidential primary. Some Democrats in Congress called for Homeland Security Secretary Kirstjen Nielsen to resign. Others railed against what they called Trump's human rights violations at the border. Liberal activists pushed forward with plans to host protests across more than 200 U.S. cities at the end of the month. And at least one Democrat, Maine Senate candidate Zak Ringelstein, was preparing to risk arrest outside a Texas detention facility to highlight the plight of young immigrants. Ringelstein said would deliver water, toys and books to imprisoned children in McAllen, Texas, later this week whether federal immigration authorities let him in or not. "If that means I get arrested, I get arrested. So be it," he told the AP. There could be political risks to the bold rhetoric. Texas Sen. John Cornyn, the Senate's No. 2 Republican, warned that Democrats risk voter backlash if they oppose GOP efforts to address the problem in Congress. Democrats "are conflicted," he said, because they "like the narrative" of blaming Trump for separating families. The Texas Republican added: "If they don't appear to be willing to meet us halfway, I think their using this for partisan purposes will be exposed." Still, Republicans were decidedly on the defensive for most of the last week on an issue that could have lasting impact on the political battlefield in 2018 and beyond. Photos of young children in chain-link cells and audio recordings of their emotional cries unleashed a flood of public disapproval in recent days as the Republican president falsely blamed Democrats for his hard-line policy of separating parents from their children at the border. In many ways, it marked a new political low point for the Trump administration, which had vowed the day before not to bend to political pressure. After Trump relented, the Democratic response was far from consistent or coordinated. It seemed at times that it was every man and woman for themselves. Former President Barack Obama and his vice president, Joe Biden, issued separate, uncoordinated statements on social media condemning Trump's policy. Biden, who has not ruled out a presidential run in 2020, said the Republican administration threatened to turn the United States into the world's "pariah." "Stand up. Show up. Speak out," Biden wrote. "No one, not even a president, can change who we are as America and what we stand for — if we the people stand united and unleash all that power that is in our hands." Iowa voters learned that another 2020 prospect, former Housing and Urban Development Secretary Julian Castro, was canceling a weekend appearance in the leadoff presidential caucus state to attend a demonstration at a refugee tent city along the U.S-Mexico border. In an interview, Castro said Trump's new order is a valid remedy only if children are immediately and humanely reunited with their parents. Republicans have no hope of retaining the congressional majority this fall, Castro predicted, should they continue to adopt restrictive immigration measures. "The president may be signing an executive order backing down, which he never does, because he's offended our sense of morality," Castro said. "He's crossed a line, whether he realizes he's crossed it or not." Vermont Sen. Bernie Sanders, who ran for president in 2016 and may do so again, lashed out at the Trump administration's family separation policy as a "human rights violation" that's doing lasting damage to the families involved. He suggested that only the "very naive" would believe that Trump's executive order had completely resolved the problem. Sanders said several Trump Cabinet members should step down in general, including Nielsen. He doesn't blame her for the latest controversy, however. "The issue right now is President Trump," Sanders said. "It's not her. Trump makes the decision." California Sen. Kamala Harris, who called earlier this week for Nielsen's resignation, plans to visit a San Diego detention facility Friday and meet privately with mothers who have been separated from their children. "This executive order in no way deals with reuniting the (asterisk)two thousand three hundred(asterisk) children who have been torn away from their parents and remain separated," she wrote on Twitter. "When will they see their parents again? They must be reunited immediately." In a conference call with reporters, liberal activists promised to begin running ads in key House races that would highlight audio recordings of crying immigrant children being mocked by immigration officials. They also raised a series of new questions for the Trump administration, including whether White House policy director Stephen Miller, who helped design the family-separation policy, would be disciplined. "The public outrage and grassroots fury about families being ripped apart has blown past even the health care fight. I've never seen anything like it," said Ben Wikler of the group MoveOn. "These fights tend to shift the underlying political ground."